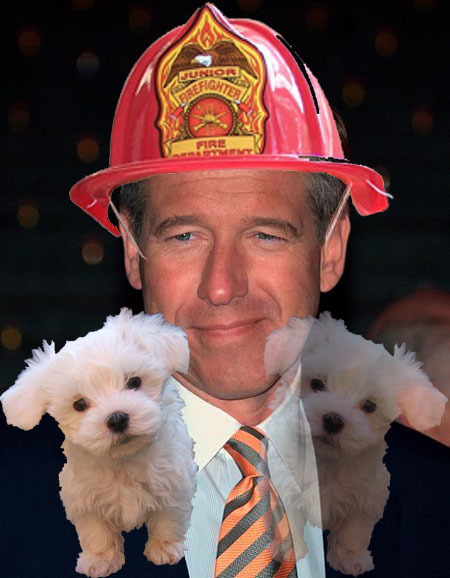 Did Brian Williams Really Save Pup(s) from a Fire as He Claimed To? i Still Love Dogs > News > Did Brian Williams Really Save Pup(s) from a Fire as He Claimed To? Brian Williams announced today that he’s taking a break from anchoring NBC News while he’s under investigation for lying about being in a helicopter that was shot in Iraq in 2003. Williams has also claimed that he saw a dead body float down a French Quarter street while he was covering Hurricane Katrina in New Orleans. However, that area of the city wasn’t flooded during the disaster. Hmmm. But that’s not all. Ten years ago, Williams told Esquire Magazine that, as a teenager, he rescued two puppies from a house fire while serving as a volunteer firefighter with the Old Village Fire Company in Middletown, N.J.
“All I ever did as a volunteer fireman was once save two puppies,” Williams said at the time. Six years later, while retelling his brave rescue tale for USA TODAY, the two puppies became one puppy. The Old Village Fire Company has not commented on the anchorman’s conflicting puppy tales — and has yet to confirm that he actually ever rescued any puppies at all. What do you think — was “Lyin’ Brian” at it again?